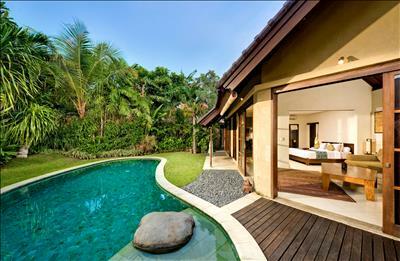 This serene villa is a paradise of natural beauty. 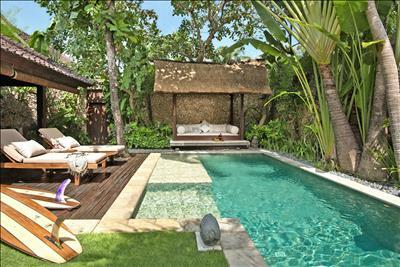 Hidden within a beautiful walled and landscaped garden, discover a stunning sun-drenched pool, a traditional, thatched balé and a beautiful, Balinese one-bedroom villa. A private wooden deck is perfect for enjoying magical sunsets or perhaps a romantic, candlelit dinner under the stars. A large, light-filled indoor-outdoor living area features contemporary designs enhanced with luxurious, natural linens, indigenous artworks and traditional Balinese accents. This open-plan design with high ceilings and sliding glass doors allows a gentle tropical breeze to circulate through the villa, or can be closed and fully air-conditioned. Step through a magnificent, carved, antique Javanese door, set in a stunning intricately designed frame, to a perfectly proportioned double bedroom with king-size bed. The bathroom in Villa 9 blends nature and luxury with a large terrazzo bathtub, placed harmoniously next to a fishpond with a water and rockery feature within mysterious jungle gardens. Ornate, wooden, antique statues peek out from behind leafy trees. 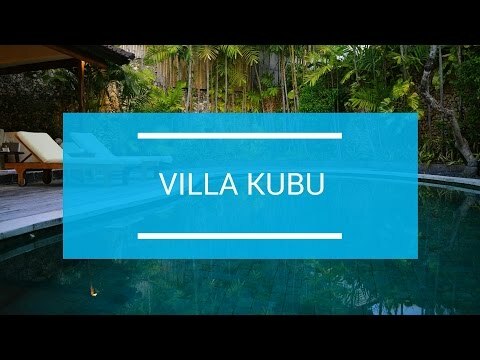 This villa offers maximum privacy with the luxury of Kubu’s full hotel services on call – enjoy a poolside brunch, a soul-balancing massage or simply a lazy day with only the tweeting birds to disrupt your peace. We'll come back for sure. We have enjoyed our time here so much. Thanks to all the staff for such a fantastic treatment. We'll come back for sure. We loved everything about Villa Kubu, everyone was beautiful + humble, love you all.